On the Traditional Chinese New Year Calendar of Events the Lantern Festival or Yuanxiao, as it is called in Mandarin, falls on the final, or fifteenth day of the first lunar month. This marks the end of Chinese New Year celebrations with a party under the full moon. The eve of Yuanxiao is another reason for families to get together and it is a fun evening, especially for children, as traditionally they make paper lanterns to illuminate and march under the full moon. Sometimes there are competitions to see who has the most beautifully decorated lantern and often a theme is designated by the city or village. Every year, some Chinese cities and towns create wonderful displays for families to view and celebrate the Lantern Festival. In Shanghai, the annual celebrations center around the Yu Garden lantern creations. See locals having fun at Shanghai's famous Lantern Festival that has incredible displays every year. What Do You See at the Lantern Festival? 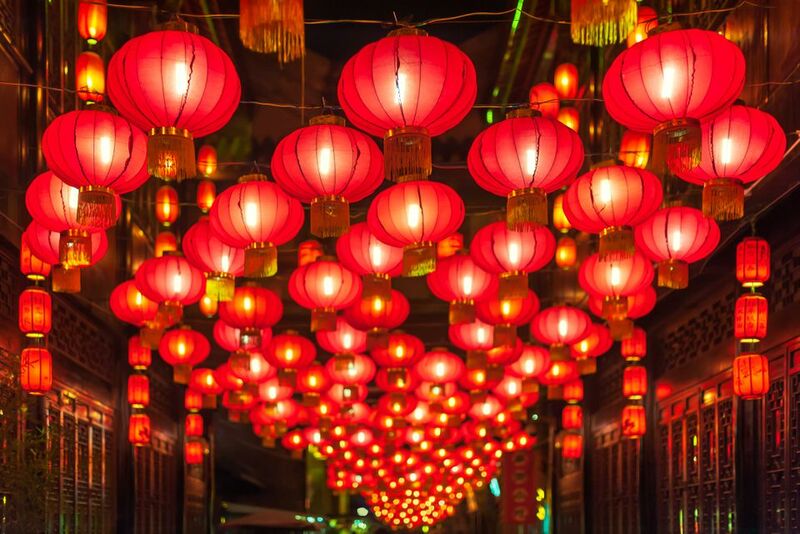 If you have never experienced a Lantern Festival in China then you probably imagine just a bunch of red Chinese paper lanterns hanging from strings along storefronts and houses. This is very far from the actual illuminations that appear in cities and towns in China. Taking the festival in Shanghai as an example, lanterns are themed around that year's animal on the Chinese Zodiac for that year. Some lanterns take the form of hanging shapes - from flowers to fish - between the eaves of buildings. Elsewhere, enormous illuminated displays take over the plazas and courtyards within the Yu Garden bazaar. There is always a large zodiac animal in one of the courtyards that is the highlight of the festival. And throughout the pathways on the nine-turning bridge in front of the Yu Garden tea house, there are beautifully illuminated dragons curling around each pole. Alongside the bridge in the water, there are displays portraying different historical or cultural stories and legends. As expected, most Chinese festivals have an ancient story behind them. The legend behind the Lantern Festival has several iterations but one of the best ones is the story of a young girl working in the Chinese emperor's palace. Yuanxiao was a beautiful maid in the emperor’s palace. Despite her opulent lifestyle, she missed her family and desired only to be home with her family during Chinese New Year. The story goes that she told the emperor the God of Fire visited her and told her that he planned to burn down the city. She suggested that the emperor should make the city look like it was already burning so the God of Fire wouldn’t bother them. The emperor took the threat seriously and had the entire court and city put up colored lanterns and light firecrackers to mimic a great fire. The palace was so busy with the preparations that Yuanxiao was able to sneak home! Shanghai has a big celebration in Yuyuan Garden at the end of Chinese New Year. Toronto’s Lantern Festival is a spectacular event that actually takes place in the summer – a much more pleasant time to be outside at midnight! Check out the Toronto Chinese Lantern Festival. Taiwan hosts an incredible Lantern Festival outside Taipei.